"July 3rd Sunset, Northern Minnesota"
"Midsummer Moonrise at the Spirit Tree"
Last night's moonrise along the Lake Superior shoreline in Grand Portage, MN. After a perfect evening of paddling our kayaks on a local lake we headed back home for a quick bite to eat before heading out again to watch and photograph the moonrise. 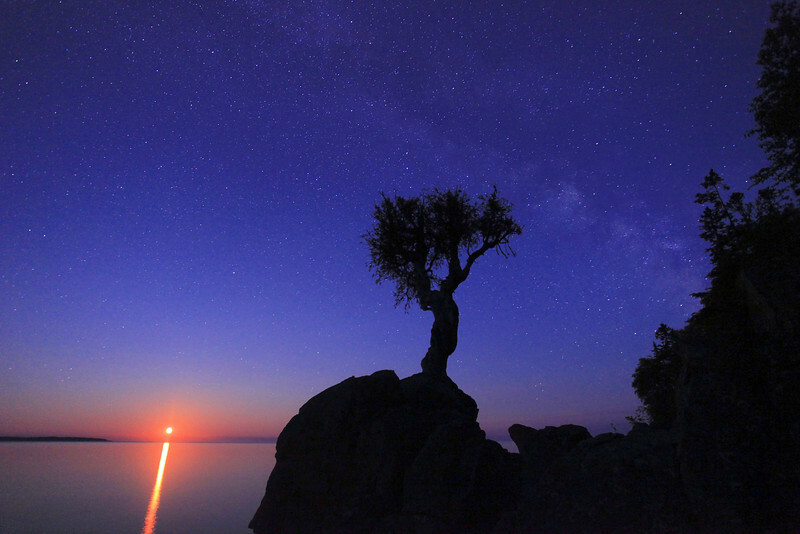 The waters of Superior were incredibly calm as the moon slowly rose between the tree and the Susie Islands. The night was so calm we could hear the cackle of gulls nesting on Long Island on the opposite side of Wauswaugoning Bay. 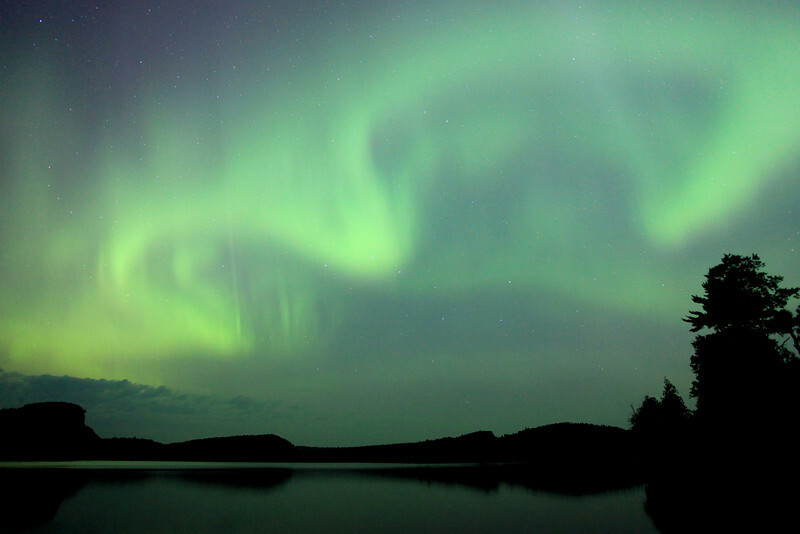 Last Friday night my friend Roger and I went out in search of the northern lights. The space weather forecast looked promising for a good showing of the Aurora, however nature had other plans. We watched and waited until almost 3:00 AM but never saw any lights. We did, however, experience some incredible moonlight. Almost the entire night there were these low-altitude, fast-moving clouds drifting by overhead. 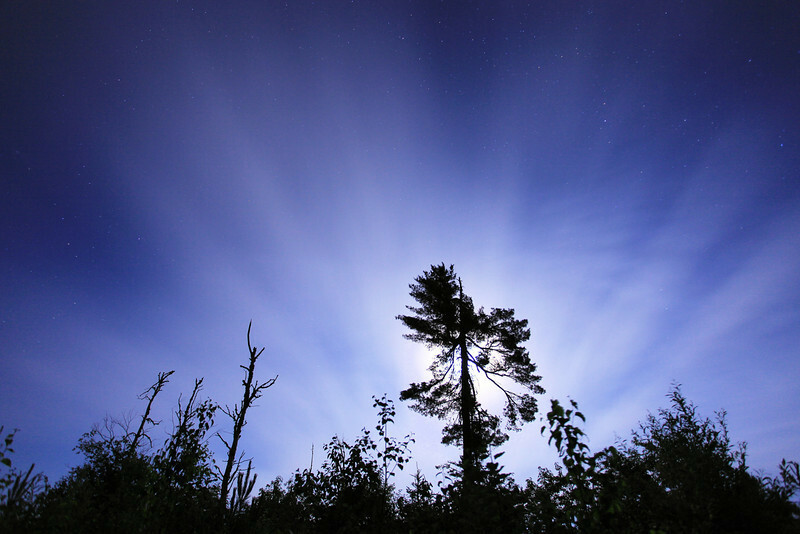 When we came upon this pine tree with the moon directly behind it, we knew we had to photograph the scene. 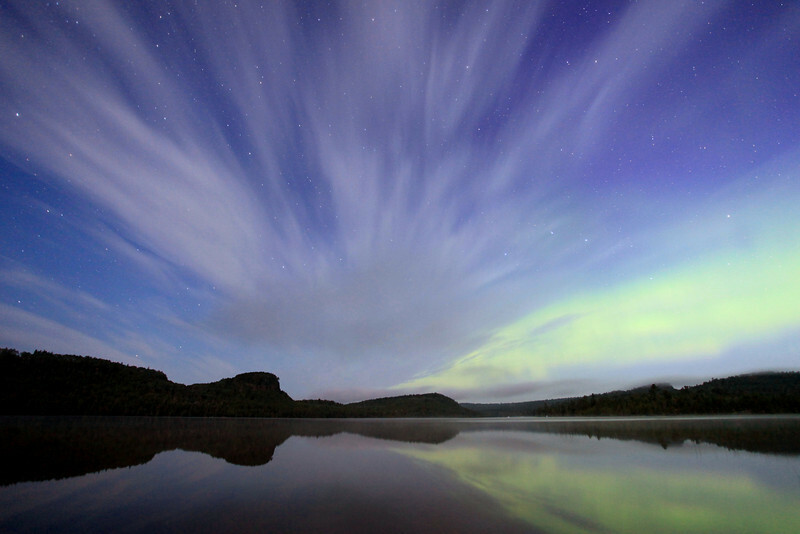 "Northern Lights over Devil Fish Lake"
Aurora Surprise! 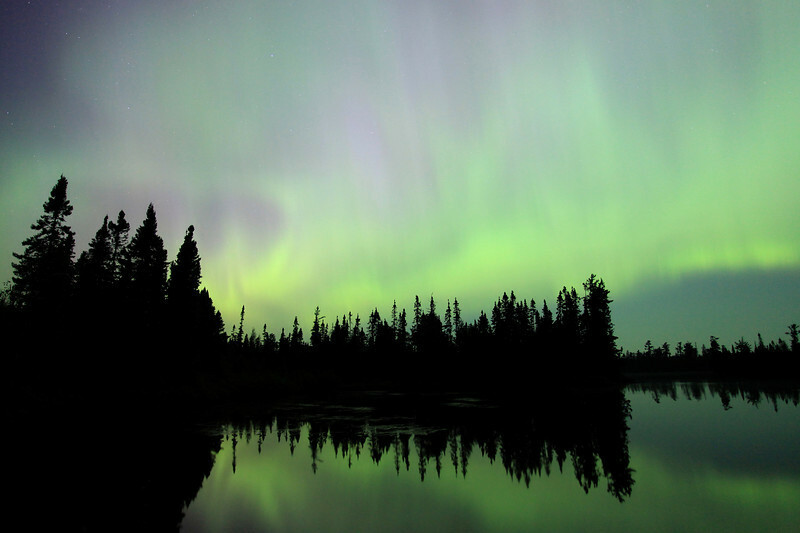 The early morning hours of July 9th began with a surprise showing of the northern lights. According to spaceweather.com, the source of the display was not an explosion on the sun, but rather a fluctuation in the interplanetary magnetic field. The IMF near Earth tipped South, briefly opening a crack in our planet's magnetosphere. Solar wind poured in and ignited the lights. 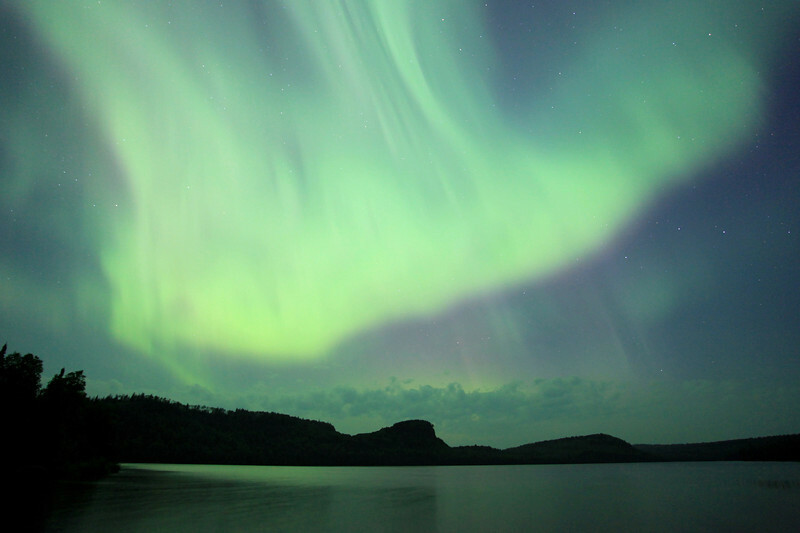 A beautiful green sky throughout the night was the result, as seen here at the public water access for Devil Fish Lake in Northern Minnesota. "Night-time in the North Country"
Here's another Aurora shot from last night. This one was taken just after 3:00 AM as the sky was starting to show the very first hints of daylight. Contrary to what this photo may lead you to believe, the clouds were NOT moving fast in this exposure. In fact, they were barely moving at all. 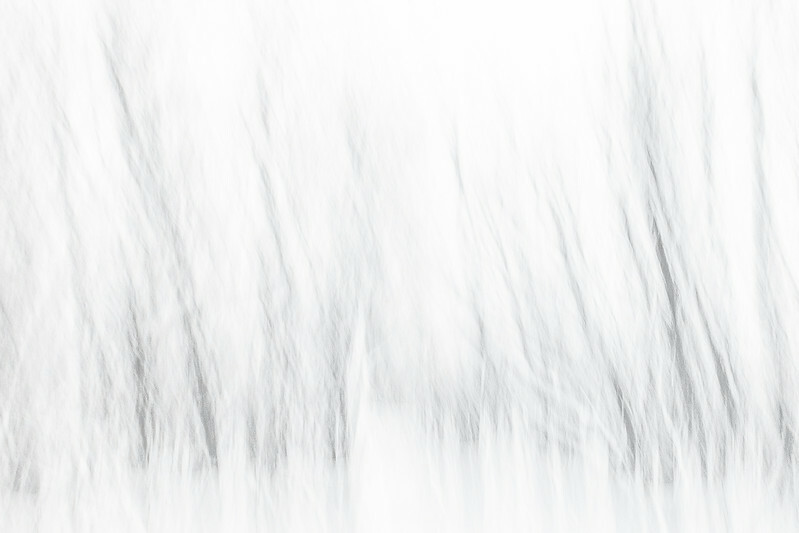 Usually you only get this effect with the clouds when they are moving quickly through the scene. This was a 30 second exposure, but the clouds moved very little in that time. They held this "streaking" formation for close to an hour. It was one of the coolest skies that I have ever seen. 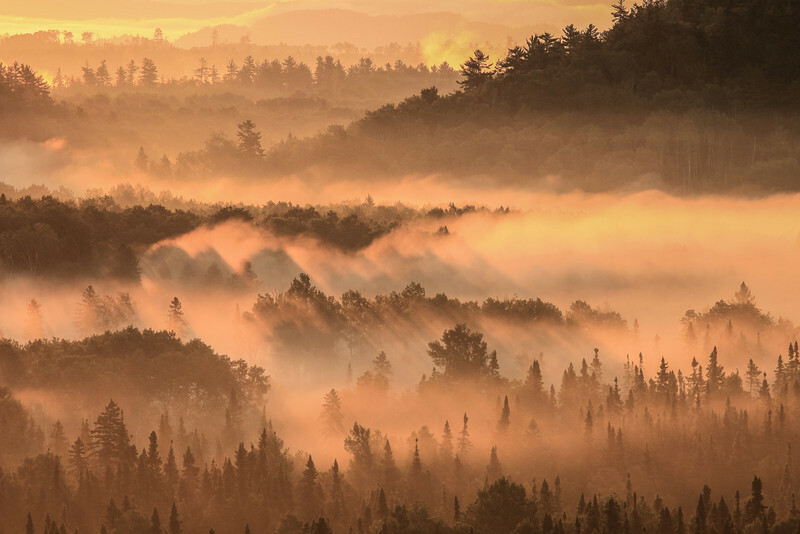 "Foggy sunrise in the Pigeon River Valley"
Can you say.... W O W !!!!!!!!!! ? This was the scene I witnessed Monday morning after spending the entire night photographing the northern lights. I had noticed the fog along the river earlier in the night and decided to come back to this location for sunrise. It proved to be a worthwhile decision. As the sun rose over the hills and the light hit the fog in the valley, the colors and layers between fog and trees were breathtaking. 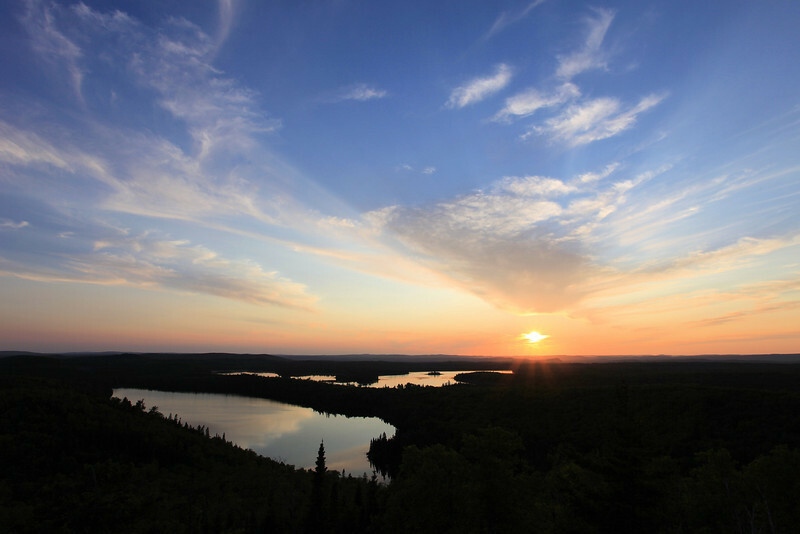 This was photographed from the Pigeon River Helipad and Overlook along Otter Lake Road in Northeast Minnesota. 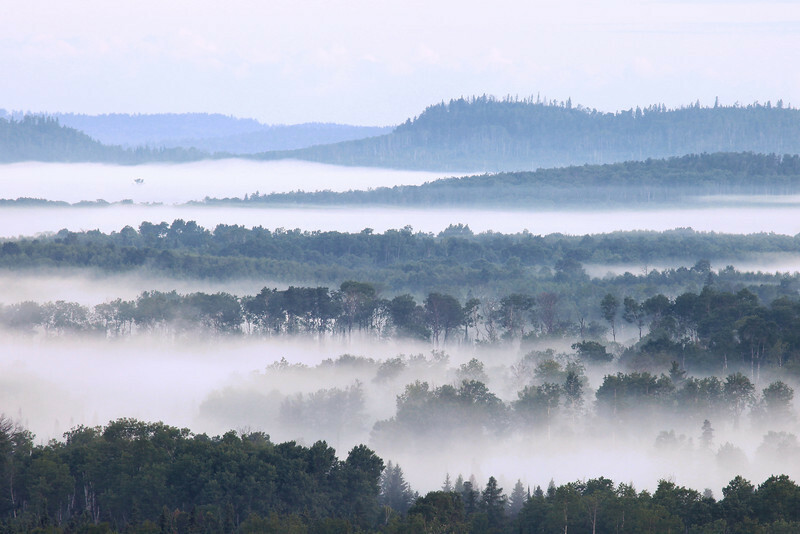 "Early morning fog over the Pigeon River Valley"
Another view of the incredible fog this morning. A shot from last weekend in Northern Minnesota. 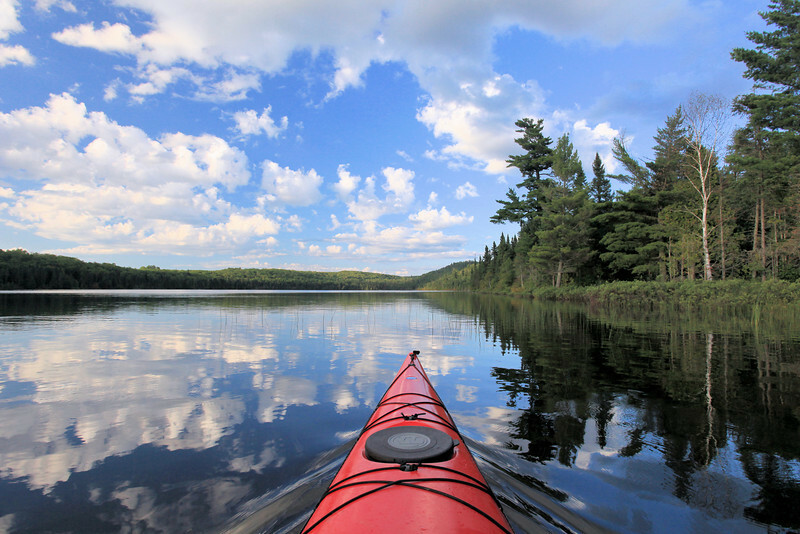 We had gone out paddling on a local lake mostly to look for Loons (of which we did find two) but also just to get out on the water and hopefully get some nice pictures. As sunset approached we were treated to some very nice clouds which reflected quite nicely on the super-calm waters of the lake. 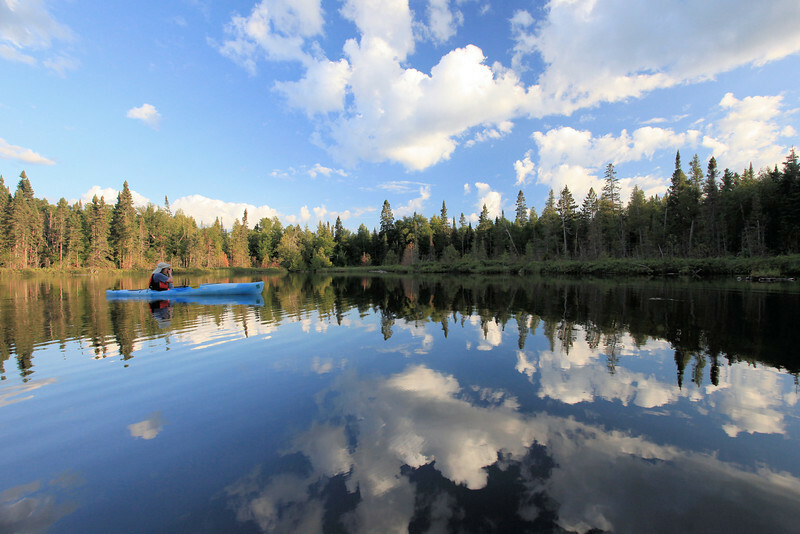 "Photographing clouds over Speckled Trout Lake"
Another shot from last night, my friend Roger in his kayak as he photographs the clouds reflecting on the surface of the lake. 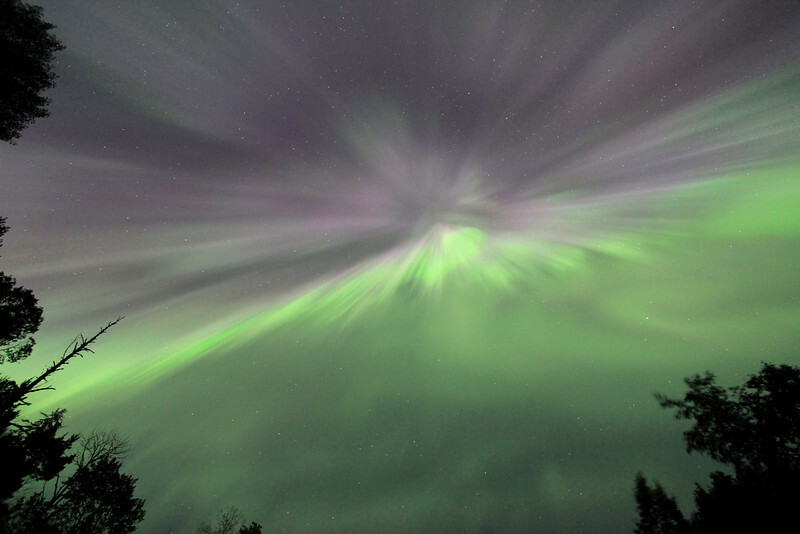 "Southeast Aurora - July 15, 2012"
From this past weekend's incredibly awesome geomagnetic storm. You know it's an excellent display of the northern lights when the best views are no longer to the north! This particular formation of the Aurora was actually emanating up from the southeast horizon! 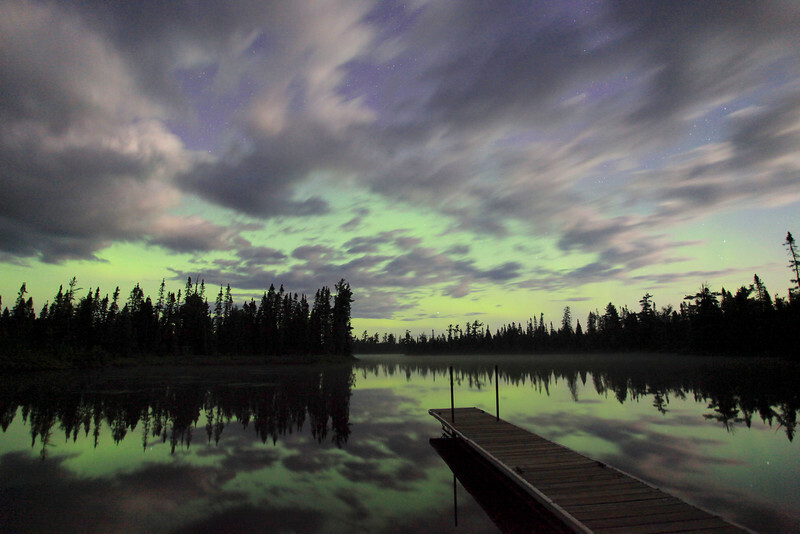 "Erupting Aurora over Devil Fish Lake"
This was the first "good" shot that I made of the Aurora on July 15, 2012. This moment occurred at just after midnight after we had already been watching the sky for about two hours. My friends were starting to think that maybe we weren't going to see a sky full of active lights that night, they thought that maybe a faint glow was all we were going to get. I told them to be patient, it's not even midnight yet. Sure enough, just after midnight the sky erupted with lights. Once you've seen how quickly the aurora can erupt and fill the sky, it's a vision that never leaves your mind. It is a phenomena that makes you feel both insignificant in the universe and grand all at the same time. On the one hand you feel incredibly tiny, realizing that the source of these lights came all the way from the sun. On the other hand, when the lights are this active they seem so low in the sky that you can almost touch them... in a way almost touching the sun itself. Any way you look at it or ponder it, it certainly is one of nature's most breathtaking sights! "Ribbon of green over Devil Fish Lake"
Here is a shot of the aurora about half an hour before the sky "exploded" and was filled with the incredibly bright lights seen in the image "AURORA 1935". 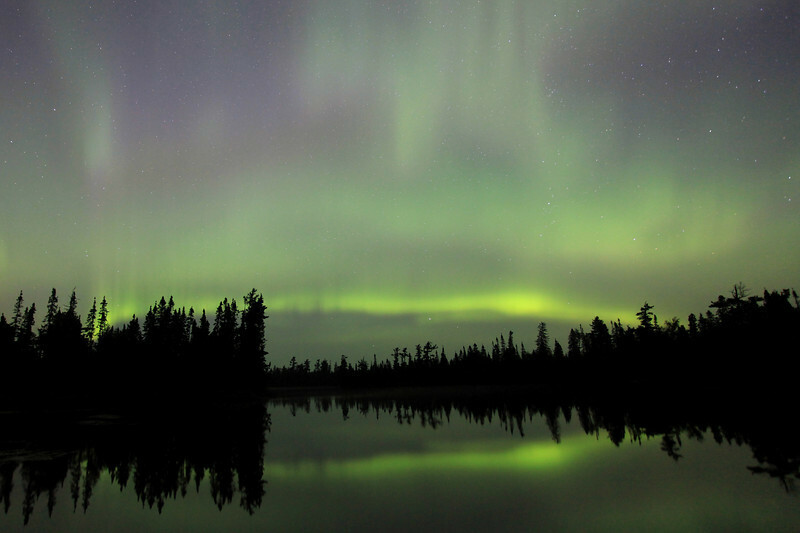 Northern lights dancing in the sky over McFarland Lake at the end of the Arrowhead Trail in Cook County, MN. "Aurora Storm over McFarland Lake"
This shot represents the culmination of probably the single best night of Aurora Borealis photography that I've ever experienced. 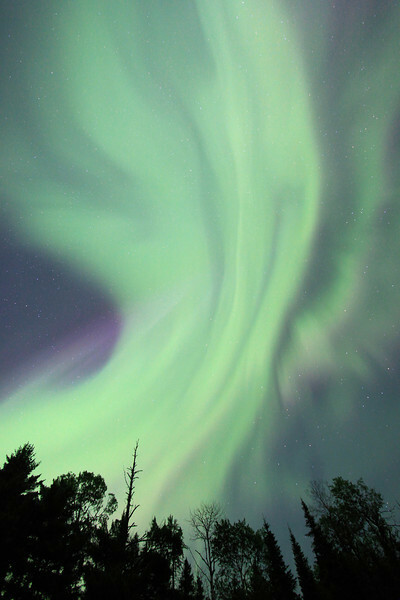 This image was made early in the morning on July 15, 2012 about 1/4 of the way into an Aurora storm that lasted almost 36 hours, one of the longest-lasting geomagnetic storms on record. Shortly after this image was made the activity level of the lights dropped significantly, although they remained visible until daylight started to creep into the sky. The following night the Aurora activity was also very high unfortunately we were unable to view it the second night due to heavy cloud cover. My friends that were with me on this night could only come up with one word to describe the lights as they flickered in the sky directly overhead. That word? WOW.